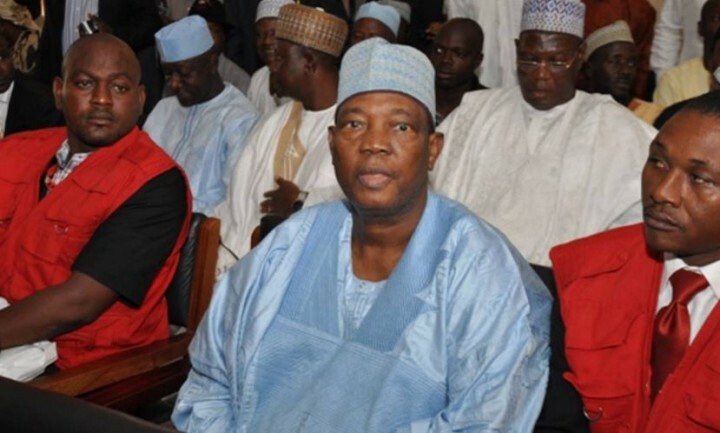 The trial of a former governor of Nasarawa State, Aliyu Akwe Doma, and two others, continued on June 23, 2016, with the Economic and Financial Crimes Commission, EFCC, presenting its ninth witness, as it closed its case against the accused persons. This was made known in apress release made available to the media by the EFCC’s Head, Media & Publicity, Wilson Uwujaren on Thursday in Abuja. Akwe Doma, alongside Timothy Anthony Anjide, a former Secretary to the State Government, and Dauda Egwa, a former Accountant-General, are being prosecuted by the EFCC on a 10-count charge bordering on money laundering and financial crimes. The accused persons between January 2007 and December 2009 allegedly conspired and fraudulently laundered state funds to the tune of N8bn, an offence contrary to Section 14(1)(a) of the Money Laundering (Prohibition) Act 2004 and punishable under section 14(1) of the same Act. At today’s hearing, PW 9, Abdulrazaq Salawu, an operative with the EFCC, told the court how he met the defendants, following different petitions and intelligence report received by the Commission. Led in evidence by Kemi Pinheiro, SAN, Salawu told the court that the investigation was carried out to establish the veracity of the allegations against the defendants. “During investigation, the team saw movements of funds from the state government account to the Secretary to the State Government. Upon this discovery, we invited some of the state officials to give explanations as to the purpose of such transfers. “In the course of the investigation, having analysed the account and discovered that several funds were released, officials in charge of finances were asked to provide payment vouchers relating to the release of such funds. Among the vouchers released were those marked ‘special releases’. ‘‘When the team asked Katsa about the purpose of such releases, he said he could not give explanations. He said that those releases were done on the instruction of the Secretary of State Government. These special releases had no approval and no supporting documents to show the purpose for which the huge sums were meant for,” Salawu said. He further stated that the third defendant confirmed that monies were released upon receiving mere phone calls. According to him, “We discovered that monies were released and were tagged ‘emergencies’. Most of these releases were without approval. Dauda Egwa in his statement confirmed that those monies were released on mere phone calls received from the former governor, Aliyu Akwe Doma. It was discovered that monies were released without memos or approvals, as the officials in charge of finance were only called on the phone to release such monies on emergency; so, it was not an error of classification. They were also released based on verbal instructions from the governor. Statements of the third defendant were admitted into evidence as P35, P36 and P37; statements of the second defendant as P38, P39 and P40 and statements of the first defendant, Aliyu Akwe Doma, as P41abc and P42 ab, respectively. The case has been adjourned to November 28, 29, 30 and December 1, 2016 for continuation of trial.